Albert was born June 6, 1891 to Jacob and Lena (Dalker) Schmitt . Eighteen years later, Albert married Edith Applegate during 1909. By then end of 1918 they had five children and Albert was an Assistant Marshal and first motorcycle policeman for the Village of Cheviot where his father was the Town Clerk . 1919 started off very badly when their fourth child, 2½-year-old Albert Jr., became ill with influenza. He developed bronchitis, then pneumonia, and on February 17, 1919 he died. On the night of May 27, 1921 Marshal Schmitt, on duty and operating a motorcycle, attempted to stop two speeding motorcycles with sidecars ; one operated by Gilbert Ahlenstorf (23), of 512 Oak Street in Elmwood Place, and carrying Miss Alvena Brennan (19) of 811 Mound Street and the other operated by Foster Lloyd (19) and carrying Mary Rison (19) also of Mound Street . Marshal Schmitt pursued the motorcycles out of the village and south on Boudinot Avenue into the City of Cincinnati . Ahlenstorf, when he saw they were being pursued, yelled to Lloyd, “Here’s Smittie. Watch me get him! ” Just before Werk Road, while the three motorcycles were travelling at 55 miles per hour, he ran into Marshal Schmitt’s motorcycle forcing it to hit the curb which caused Marshal Schmitt to be ejected and propelled head first into a tree. Ahlenstorf’s motorcycle also went down spilling him and his passenger. Lloyd stopped and told Miss Rison to get out. Ahlenstorf ripped the license off his wrecked bike. Miss Brennan begged for help for her injured foot. Marshal Schmitt lay broken and bleeding beneath the tree. Ahlenstorf got onto Lloyd’s bike and both rode off. A pedestrian who witnessed the crash wrote down the license number and gave it to the first Cincinnati officer on the scene, District 3 Patrolman George W. Berheide. Marshal Schmitt’s injuries included a fractured skull and he was rushed to General Hospital in Cincinnati. Misses Brennan and Rison claimed to not know the names of the suspects; asserting that they met them downtown and accepted their offers for a ride. Marshal Schmitt was survived by his wife, Edith (Applegate) Schmitt (29), and four children, Alice (12), Oliver (10), Ruth (8), and Freeman R. (2); his parents, Jacob J. and Lena Schmitt ; Edith’s parents, Ollie and Dorothy Applegate ; and his siblings . He was laid out at his home on Woodbine and services were held at 2:30 p.m. on Monday, May 30, 1921 at the Cheviot United Methodist Church at Harrison and Lovell Avenues . More than 600 people participated. Edith was so distraught that she could not participate except in the graveside services; where she collapsed. She remained unconscious for several hours at home . Marshal Schmitt was buried at the Bridgetown Protestant Cemetery on May 31, 1921. Cincinnati Detective Chief Emmett D. Kirgan, Detective Christian Wolf, and Detective Joseph E. Brink conducted an investigation. By the end of the day, they had identified Ahlenstorf and he had not returned to his home since the incident. 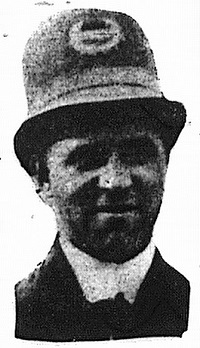 Cheviot Police found and questioned Lloyd during the morning of May 29, 1921. Lloyd admitted to being the other biker, but asserted that he turned off of Boudinot before the crash and did not see it. On June 17, 1921 they swore out a warrant for Manslaughter . On June 21, 1921, Ahlenstorf turned himself in, denied that he ran into the officer purposefully, and was released on $5000 bond. Lloyd fled to Florida and, during 1925, married a teenager and had a child. He returned to Cheviot by 1930 and his wife died one year later. Lloyd moved back to Florida and died in 1959. There is no indication that he was ever charged with any crime. A Grand Jury heard the case and Cheviot residents were “considerably dissatisfied,” according to the Cincinnati Enquirer, when it was announced the it had ignored the charge of Manslaughter against Ahlenstorf . About 1¼ years later, on September 24, 1922, while carrying three other men on his motorcycle, Ahlenstorf ran into a car at Beekman and Arlington Streets. Three more were injured in that mishap and he was charged with Reckless Driving. Edith Schmitt was diagnosed with uterine cancer within five years of the death of her husband. She died June 20, 1927 and was buried next to him . The youngest three remaining children went to live with Edith’s parents, Ollie and Dorothy Applegate. During 1937 Jacob Schmitt, still the village clerk, was killed in another vehicle mishap. The next year, on May 11, 1938, Marshal Schmitt’s son, Oliver, was killed in an automobile crash in Hamilton, Ohio . On July 20, 1972 another son, Freeman Schmitt, was killed in a farm accident involving a tractor near his home at 5572 Muddy Creek Road. Marshal Schmitt’s death was brought to our attention by David Weeks, an Officer Down Memorial Page (ODMP.org) researcher in North Carolina, and forwarded to us by ODMP CEO Chris Cosgriff. 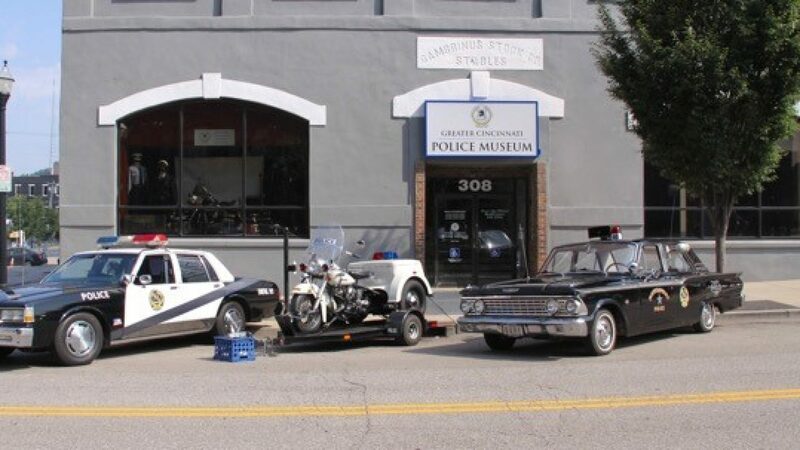 The Greater Cincinnati Police Museum’s Memorial Committee further researched the incident, notified the Cheviot Police Department, and published an account of it on January 25, 2013. Cheviot Police Chief Joseph Lally and the Greater Cincinnati Police Historical Society collaborated to have Assistant Marshal Schmitt included on the National Law Enforcement Officers Memorial in Washington DC. The “Names Committee” met on December 3, 2014 to establish his eligibility. His name was etched into the Memorial and he was officially inducted on May 15, 2015. This narrative was revised May 28, 2016 by Cincinnati Police Lieutenant Stephen R. Kramer (Retired), Greater Cincinnati Police Historical Society President, with research assistance from Cincinnati Homicide Detective Edward W. Zieverink III, Greater Cincinnati Police Museum Historian, and SORTA Operations Superintendent Philip Lind (Retired), Greater Cincinnati Police Museum Registrar. All rights are reserved to them and the Greater Cincinnati Police Historical Society.